A selection of essays by a pioneer in the application of systems theory to political analysis, Macropolitics develops the author's concern with the philosophical foundations of political science, and with the extension of philosophical principles into the realm of empirical analysis. For this volume, Kaplan has written a long essay on the philosophical foundations of his work, which constitutes one of his most important statements. He develops and explains within a philosophical context his contention that values can be treated in an empirically meaningful fashion. Organized to expand or illustrate the major points raised in this introduction, the essays that follow deal with such topics as the nature and utility of systems theory, empirical treatment of historical explanations, the systemic and psychological foundations of values, and empirical applications of systems theory in analyzing international political systems. Enlarging the dialogue between conflicting viewpoints, Kaplan exposes the common roots of Western scientific thought and Marxist philosophy, emphasizing that both status quo and revolutionary philosophies are one-sided. 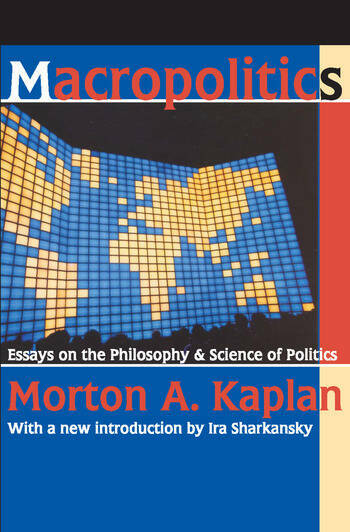 In his new introduction, Ira Sharkansky sees this as a truly groundbreaking work: "thanks in considerable part to the contributions of Professor Kaplan, international relations theory is a major component of political sciencei?1/2a milestone on our quest for understanding i?1/2 a distinguished part of the ongoing record." When the book first appeared, William Welch in the American Political Science Review called it "excellent: his weighing against the evidence of competing hypotheses is truly exemplary i?1/2 thorough, careful, fair-minded."